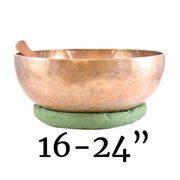 Our Tibetan hand hammered singing bowls are high quality instruments, which come with a wooden striker and attractive cushion. 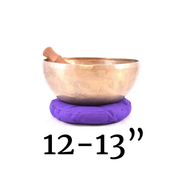 Each of these listings has an individual recording of the bowl you will receive. They may come polished, or unpolished in their original form with beautiful, smooth hammer markings visible and a great smooth patina. These bowls are all from the Himalayas regions near Tibet, usually Nepal. 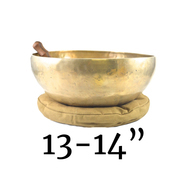 Bowls such as these been used in Tibetan Buddhist meditations and Bon shamanic practices over the centuries. Each bowl is hand selected for its tone, size, and quality. Each has a wonderful voice that can carry for a very long time, instilling deep states of tranquility or wellness. It can be struck like a bell, or 'sung' by passing the wand/striker around the outside edge, much like our crystal bowls. 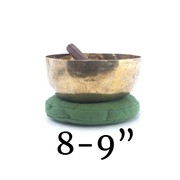 Most people use these bowls for meditation, chanting, for relaxation or personal healing, to incorporate in their professional therapeutic healing practice, or for their aesthetics, for fen shui, or even a conversation piece. 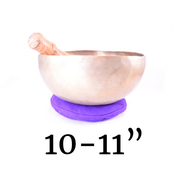 While many health claims have been made regarding these bowls, science shows they can induce deep states of relaxation, and wellness. 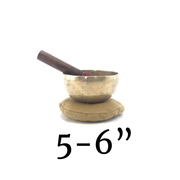 They have been used in holistic healing and psychotherapeutic arts extensively. 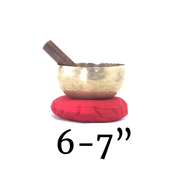 Some people use the bowls and bells to bring about a state of calmness when receiving medical treatments, as various sound and music practices have been shown to be quite effective before, during and after surgery, for instance. 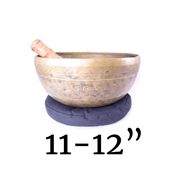 Small Tibetan bowls can be placed and sounded directly on the body, or on one's chakras, carrying their vibrations directly into tissue or etheric field, for deeper stimulation of their relaxing sounds and harmonies. 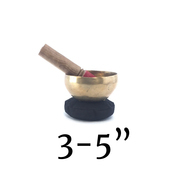 Gently and steadily rubbing wooden mallets along the rims of these sacred instruments produces tones and overtones which are said to harmonize with the elements and beings in the subtle realms, as well. 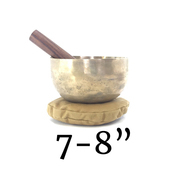 Bowls can also be used on the body, in patterns around the auric field, on the chakras, or in healing spirals. 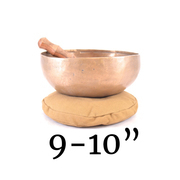 They can be used for shamanic journeying, or simply to transport one's consciousness to clearer or more grounded place. 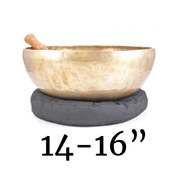 Our Tibetan Singing Bowl includes wooden beater and cushion.